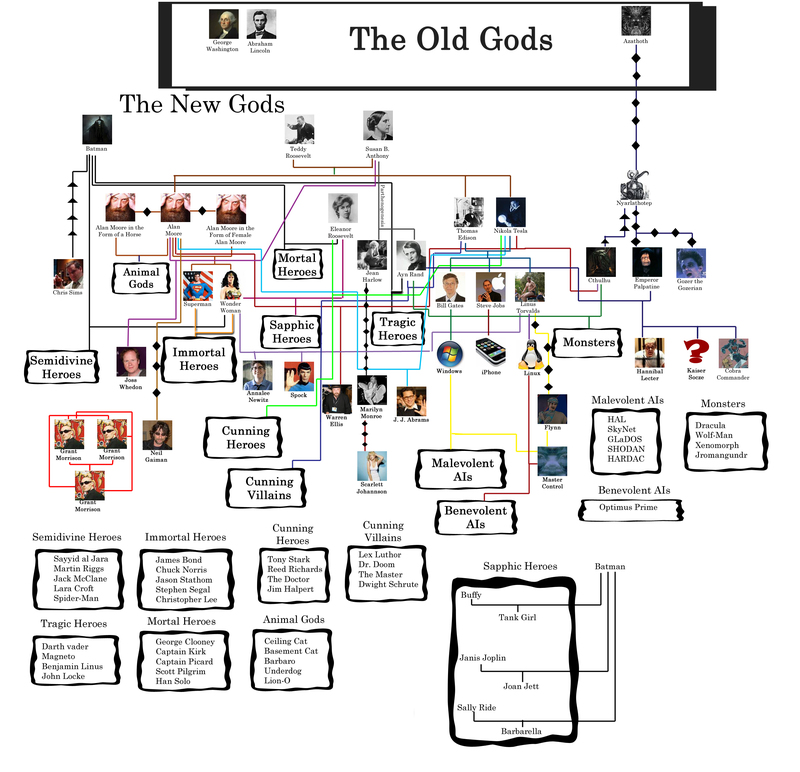 Painstakingly reconstructed from spotty 20th-century records, the following is a cosmology of significant mythic figures of that era, their relations, and their offspring. Lines with triangles indicate servitors. Lines with diamonds indicate modes (aspects, avatars, and incarnations). This must have taken you hours. Well, your weekend was more productive than mine, at least. Wait, productive might not be the right word. It…took me both longer than I thought it would, and longer than I’m really comfortable admitting. I was optimistic; the sketch took, like, two minutes. I would have included R2-D2 under “Benevolent AIs,” but otherwise, yes, this is correct. This is great. …It is Statham though. There are a lot of variant spellings in 20th century mythic literature. I’ll be honest: I had no idea Batman got around this much. I mean, yeah, flashy car, lots of money, he got around. But man was he prolific. Seems like if you lived back then you were either a part of his harem or the fruit of his loins. Learn something new everyday. Practically all of the heroes of the twentieth century were descended from the Batman. And, as you might suspect, all women were either irresistibly attracted to him, or considered it a moral imperative to bear at least one of his children. And yet, Mortal Hero Clooney rendered the Batman powerless in the eyes of his people for nearly a decade. My memories of the 20th century are hazy, but I feel like there was some sort of epic poem dramatizing the battle. Yes, now that I think about it, I vaguely recall it involving some kind of armored muscle-man who made literally thousands of ice-based puns, before taking over the western half of the country. And that is what started the whole Red State/Blue State divide. This is history, you can’t dispute it. I am so late to this, but… wow. Awesome. To try and say more would diminish it, because I’m just not that clever. Is there a cosmogeny1.jpg up there somewhere? I probably just ended up getting confused and uploading it twice.